Earlier this week, a young Syrian boy made the news in the worst, most captivating fashion. It often takes one photo of an atrocity to get the attention of the world for even a news cycle. Be it a tween naked and napalmed in Vietnam, a starving Sudanese child next to a leering vulture, or last year, the delicate, tossed-aside body of a Syrian toddler who drowned as his parents tried to make it to Europe, photos are the easiest, fastest way to remind comfy Westerners that there is always some kind of abject misery happening in the world outside of their vision. This time the boy lived. A dazed five-year-old whose home was hit by an airstrike sits in a chair seemingly unaware of the photographer, or anything around him. The boy and his family were all trapped in their home in Aleppo, but survived; making the disturbing photo at least have a somewhat happy ending. On the other hand, that boy looks far too old. No little kid should have to look like that, but thousands of them do every day. We just don’t see it. It’s a compelling image, but it’s from Syria, and there might just be a reason that you’ve been made sure to see it. 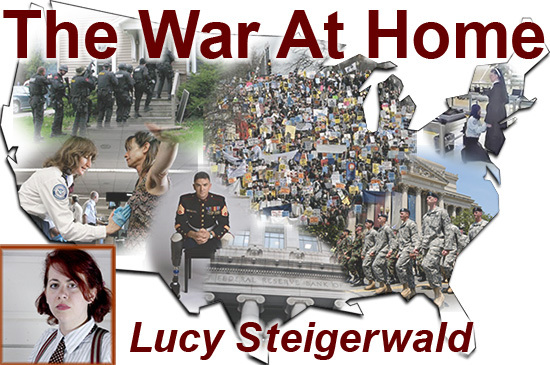 The war there is catastrophic for life, property, and stability. The five-year-conflict has made millions of refugees, and killed up to half a million people. Anyone with empathy wants to do something, and people who either have no empathy, or have too long been getting high off of their own imperialist supply would just love to do something. Former Antiwar columnist Kelley Vlahos wrote last week over at The American Conservative that Hillary Clinton promised not to send ground troops to Syria. Vlahos is understandably skeptical because, well, when does Clinton ever want to take something off the foreign policy table? In the piece, Vlahos writes that Clinton may say no ground troops, but her record, her people, and her backers suggest that that will be a flimsy technicality at best. After all, are any of the 4500-plus Americans currently in Iraq “boots on the ground”? Not officially! President Obama has often felt like a warmonger, considering his drone assassination program, the Libyan invasion, and the slow trickle back to Iraq. However, his Secretary of State Clinton was always champing at the bit to get more aggressive. She, as Vlahos noted, wanted Syrian strongman Bashar Al-Assad out, and most likely still does. Furthermore, in the most hawkish circles, Obama is still seen as the wuss who failed to follow through on his “red line,” thereby embarrassing America (I mean, leaving Syrians to die). Getting Assad out sounds swell, provided that you have the magic touch necessary to find and aid only the rebels who aren’t the terrorists you thought you were fighting, and that you can somehow prevent a disastrous power vacuum from destroying the country even further. A devoted hawk might claim that it couldn’t get any worse over there, but when the US government intervenes, it always can. That impulse is shared by the nastiest people in the world, and the most tenderhearted. Both want to meddle with this tragedy, and mold it into something else. Besides the private sponsorship of refugees, there doesn’t appear to be much that the average person can do, however. Saudi Arabia and the US have been buddies since the 1930s. American has never been one for consistency over which nations offend its humanitarian sensibilities. Pragmatism wins the day. And pragmatism is the only thing that could justify the continued alliance with Saudi Arabia, a theocracy more strict than Iran’s, which prevents women from driving, and regularly beheads its prisoners. A nation that is also currently leading a vicious bombing campaign and war in Yemen, which has lead to thousands of deaths, and potential starvation for hundreds of thousands; not to mention, more than two million people displaced. All of that because the Saudis are overly concerned about which assholes are in charge of Yemen, and the civilian casualties are not a concern. It’s a humanitarian crisis as well, but earlier this month the US sold $1.15 billion in weapons to the Saudis. Obama has sold that a hundred times over during his nearly eight years in office. The UK has also lately granted Saudi Arabia billions of pounds worth of weapons. Earlier this month, too, the ceasefire failed and the bombings started – as they have off and on since the war began last year. The Saudis even recently took a page out of America’s book and managed to bomb a Doctors Without Borders (MSF) hospital! The US officially condemned that because having a poker face is an essential part of working for the state department. Unfortunately, as that link notes, the Saudis have done this several times before during the conflict. Sometimes the Times and other luminaries are in the first bleachers jumping and cheering about war. Sometimes, pleasantly, they decide to have an official editorial board piece condemning a conflict and scolding the president. A small collection of representatives are also trying to block the US’s only-semi-proxy Yemen actions, considering that they’re more than “just” sales, and are clearly military aid that some could argue constitutes a real intervention. Whether Congress or the Times manages to actually reach out and remind Americans that still more blood is being spilled with their sleepy help seems unlikely; Unlikelier still as we’re faced with President Hillary Clinton. But at least they’ve noticed that the war is going on.